Ah, fantasy fiction, you are a fickle friend. You draw us in with your fanciful invention, and then you leave us longing to enter the pages of a book, to travel to a world of fantasy. You and I both know the worlds created by authors have that effect on us. They dream up these places that sparkle with something tantalizingly familiar yet altogether uncanny. Trust me, I have a hard enough time with the urge and desire to see the real world. And yet, that’s one of the wonders of a book isn’t it? We get to go to these places, at least in our imaginations. Books can inspire our imaginations and our real-life attitudes. They take us to places of which we’ve never dreamed, and that is pretty cool. I wrote The Beauty Thief based in a world of fantasy. It’s much like the real world, but can be bent to my will. Dangerous ground, I know, but I try to only use my powers for good! hehe The world of the Twelve Realms is the perfect place for my characters to live, and today I’m going to give you a rundown of it. I thought about not posting the map here, but decided it might help you see the layout better than just seeing the names. 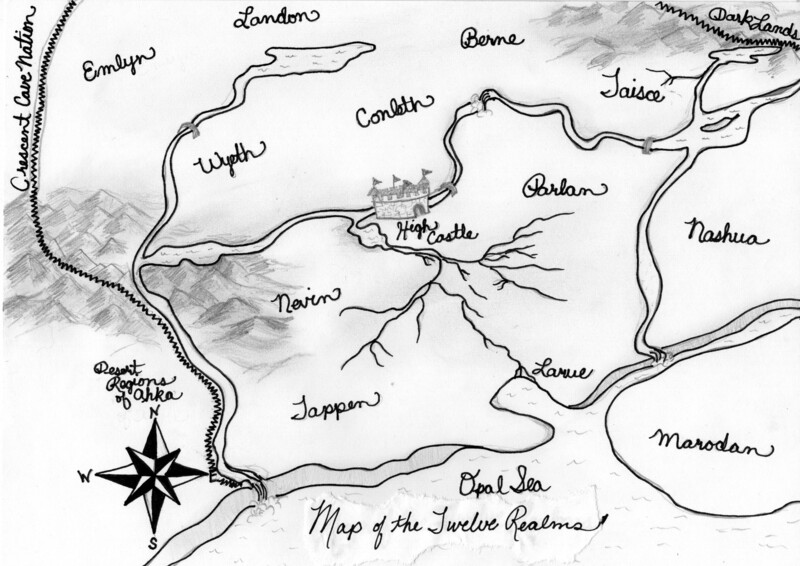 I’ll start with the castle at the center and then head over to Taisce, where our story begins. Landon [lan-dun] means from the longhill and they raise goats and sheep. They collect the fleece of the sheep and sell it for making clothing, etc. I love names. I’m drawn to Celtic/Irish names, but Arabic names also catch my attention. Of course, I’m happy with the sounds of almost anything foreign to my ears. I think that’s another reason I love fantasy fiction; the foreign sound and feel of things intrigues me. What about you? What do you like about fantasy fiction? Do you prefer a different genre? What draws you to it? Maps are so much fun! I love the way yours turned out. I’m still working on mine, lots to figure out, hehe X) I like the foreign names you chose–I too enjoy using foreign names; it really adds to the whole fantasy feel of a world for me. Wow, your state has a lot going on 😀 That’s so interesting how diverse one area can be. I love fantasy fiction. I love that there are no rules,that you can make a world and have it be anything you like, invent anything you like. I like your map. Map-making is where I struggle. How do you decide where all the different areas go? Geographically, I mean. I feel the same! 🙂 As far as map-making goes, I generally picture the flow of a story, the importance of places and what each part will contribute to the story and the underlying story that only I know. I draw rough maps first and scribble, then I dream about what the land looks like…are there mountains? Are there any special kinds of flora or fauna? How does landscape effect that in my made-up world? Does it follow the same kinds of rules as the real world or are things different? I just love real maps and globes, too, so I spend time looking at them, too. Since I drew my original maps early on in the book-writing process, I actually had to move a few things around and add extra features that the map didn’t show at first but were major parts of the landscape in the story (and the continuation of the series, the next book travels across the Opal Sea and back, then I’ll move off toward the north for the one after that.) 🙂 Really, I could have put the realms in any order, but because of the back story, they had to be put where they are in order to make sense for the history of the land and it’s people. HAHA, I probably made it sound much more complicated that it actually is! Don’t worry. I followed you. 🙂 I like your method. Do you worry about whether it makes sense climate-wise? I mean, whether the deserts and mountains and grasslands and things are in the “right” places? That’s a great question! Actually, I live in the state of Washington and it is a very good guide for me on how differing climates can be right next to each other in seeming incongruous fashion, so I don’t worry about it too much. I think it can be important to consider how rivers, mountains, oceans, trees, and other landscape details can effect the climate or map, but it’s amazing to me how one can go from desert to grassy high plains or forests in relatively short distances. Mountains can have deserts on one side and lush wetland on the other. There can be a large variation in elevation which also effects climates, but maps won’t always show you that, so one can use her story to determine things of that nature, I think. I love your questions! You are so thoughtful with them. Thank you for answering my questions. I feel a lot more knowledgeable now. Map-making here I come!